In India, close to 14% of people were aged 5 or under, and each five-year age bracket above this contained an increasingly smaller proportion of the population. France's population, by contrast, was more evenly distributed across the age ranges, with similar figures (around 7% to 8% of all people) for each five-year cohort between the ages of 0 and 40. 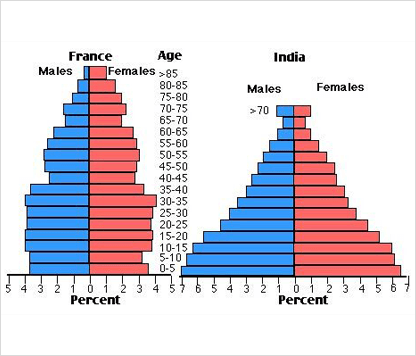 Somewhere between 10% and 15% of all French people were aged 70 or older, but the equivalent figure for India was only 2%. Looking more closely at gender, there was a noticeably higher proportion of Frenchwomen than men in every cohort from age 50 upwards. For example, almost 3% of French 70- to 75-year-olds were women, while just under 2% were men. No significant gender differences can be seen on the Indian population chart. Looking at the information in more detail, we can see that 82% of the UK's dangerous waste is put into landfill sites. This disposal technique is used for 55% of the harmful waste in Sweden and only 22% of similar waste in Korea. 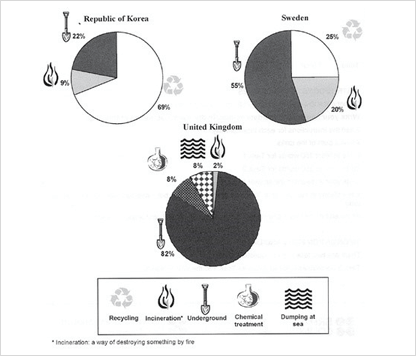 The latter country recycles 69% of hazardous materials, which is far more than the other two nations. 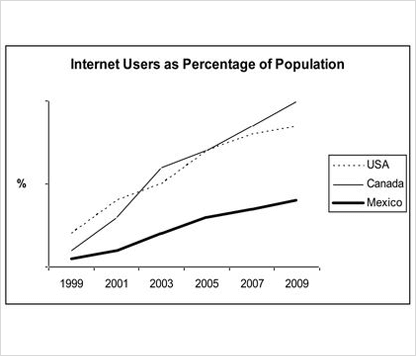 In 1999, the proportion of people using the Internet in the USA was about 20%.The figures for Canada and Mexico were lower, at about 10% and 5% respectively. In 2005, Internet usage in both the USA and Canada rose to around 70% of the population, while the figure for Mexico reached just over 25%. The pie chart below shows the main reasons why agricultural land becomes lessproductive. The table shows how these causes affected three regions of the world during the 1990s. The pie chart shows that there are four main causes of farmland becoming degraded in the world today. Globally, 65% of degradation is caused by too much animal grazing and tree clearance, constituting 35% and 30% respectively. A further 28% global degradation is due to over-cultivation of crops. 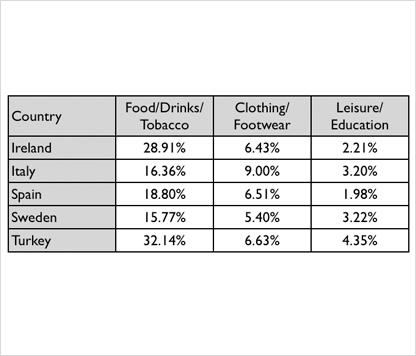 Other causes account for only 7% collectively. These causes affected different regions differently in the 1990,with Europe having as much as 9.8% degradation due to deforestation, while the impact of this Oceania and North America was minimal, with only 1.7% and 0.2% of land affected respectively. Europe, with highest overall percentage of land degraded (23%), also suffered from over-cultivation (7.7%) and over-grazing (5.5%). 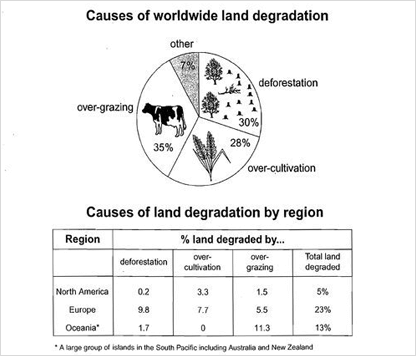 In contrast, Oceania had 13% of degraded farmland and this was mainly due to over-grazing (11.3%).north America had a lower proportion of degraded land at only 5%, and the main causes of this were over-cultivation (3.3%) and, to a lesser extent, over-grazing (1.5%). The diagrams below show how glass containers,such as bottles,are produced and recycled. 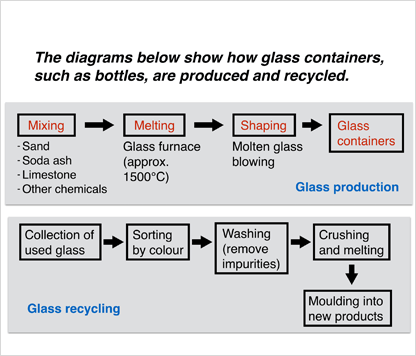 The diagrams illustrate the processes of how to produce and recyle glass containers. It is clear from the diagrams that there are three stages in the process of making glass containers. Meanwhile, four steps are required to recycle glass. At the first stage of producing glass containers, sand is mixed with soda ash, limestone and other chemicals. This mixture is then brought and is melt in glass furnace where it is heated in high temperature which is approximately 1500˚C . The process continues with shaping the molten glass blowing, and then glass containers are produced at the final stage. The first step of recycling glass is collecting the used glass. This collection is then sorted by colourbefore washing to remove impurities. The next steps of the cycling process, the sorted materials are crushed and melted. At the final step, these materials come to the moulding stage where they become final new products. 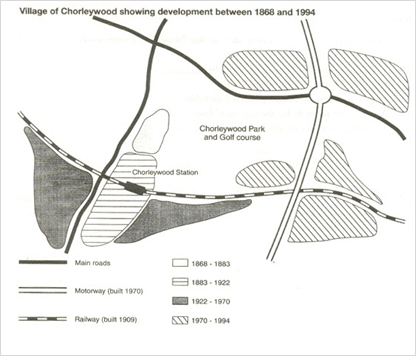 The map shows the village of Chorleywood showing development between 1868 and 1994. The map shows the growth of a village called Chorleywood between 1868 and 1994. It is clear that the village grew as the transport infrastructure was improved. Four periods of development are shown on the map, and each of the populated areas is near to the main roads, the railway or the motorway. From 1868 to 1883, Chorleywood covered a small area next to one of the main roads. Chorleywood Park and Golf Course is now located next to this original village area. The village grew along the main road to the south between 1883 and 1922, and in 1909 a railway line was built crossing this area from west to east. Chorleywood station is in this part of the village. The expansion of Chorleywood continued to the east and west alongside the railway line until 1970. At that time, a motorway was built to the east of the village, and from 1970 to 1994, further development of the village took place around motorway intersections with the railway and one of the main roads.